One of the most important challenges with higher current sensorless brushless DC applications is not so much the electronics of the design but the mechanical/physical design of the board itself. With these sorts of currents, heat dissipation, especially around key components such as mosfets is the biggest challenge to be overcome. This project overcame this issue by working closely with the customer to develop a dual strategy for taking on this issue. Bespoke casings and pre-agreed mountings meant that the design fitted into the casing in a way which helped heatsink the units. This in combination with a 4 layer and heavy copper PCB allowed the controller to perform well. 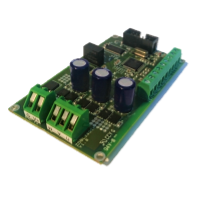 With such a high powered brushless DC (BLDC) controller, actively monitoring the temperature of the board itself is critical to protecting the board, especially in changing environmental conditions. Due to the specific nature of the application there are also further potential risks from over heating so it was vitally important that intelligent temperature monitoring system was used (as opposed to a simple over-temperature shut off). By actively measuring the temperature of the board and the external temperature input from the motor it is possible to protect the controller, motor and entire system. In this particular application the customer required I2C over RS232. The reason that the customer chose this method was to ensure a synchronous protocol over asynchronous hardware. This took some time to get right but worked well in the end with the customer being more than happy with the results. This system was then used to control all of the basic motor controls (enable, direction, speed), application specific preset motor run options, an additional solenoid control as well as safety critical features such as fault analysis, battery monitoring and temperatures. Additional memory was used in this system for two main reasons. The first and simplest, was to enable the controller to save preset run programmes for the specific application. This enables the user to run these programmes very quickly, something which was critical to this particular application. Motor currents (maximum and average). This system then enables the performance of the final product to be actively monitored and can then highlight upcoming maintenance issues. Whilst developing the diagnosis system for this controller, it was realised that it would be hugely advantageous to monitor these against time. By adding a real time clock to the board it is therefore possible to do this both for placing specific events and how they have impacted on the performance of the controller but also monitoring how performance might change at certain points of the day/year depending on the specific application. This simple addition also enabled the integration of a user prompt system highlighting the need for a service after a certain amount of time has passed. One of the issues with such high current boards is that they require very large capacitors in order to function. However, such is the charge requirement from these capacitors that connecting direct to the battery would cause a spark as the capacitors quickly charged up. To protect the board from the numerous potentially negative consequences of this sparking (for example damage to other components, damage to battery, melting connectors) we developed a power delay circuit. This circuit provides a 400mS delay and ramped increase in power from when the unit is connected to the power. This protects against the potential dangers caused by these sparks. This project undoubtedly had its challenges, whether it be keeping the board cool with the high current demand or implementing the slightly unusual communications system. That said, the resulting controller has proven to be a highly capable board in a harsh environment. As a result of this difficult environment we placed safety and longevity at the heart of the design. System such as the onboard diagnosis, active temperature monitoring and real time clock enable the board to work for exceptionally long periods of time in a difficult environment.